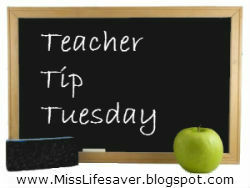 Today's Teacher Tip is my final recommendation (for now) for minimizing disruptions in the classroom. My tip is to create a Supply Center to make everything accessible for students. This sounds like a no-brainer, but think about how often we make things convenient for ourselves versus our students. When I was setting up my classroom for my first year of teaching, I had a giant rolling cart, which I decided I would use to hold any and all supplies my students may need. The drawers on top contained markers, colored pencils, scissors, glue, and sticky notes. I kept a stapler and tape dispenser there for my students so they wouldn't touch the ones on my desk. You can see that I also had a container of pens for students, which is where I'd throw the ones I found on the floor for those students who just can't seem to remember a writing utensil for class. The trays held my late work and absent work forms, extra handouts, and each class had a designated tray where we would put work for absent students to collect when they returned to class. The inside of the cart (sorry, I don't have a picture) housed highlighters, construction paper, packets of lined paper and copy paper in various colors for our projects, rulers, scrapbooking supplies, and other things I can't remember at the moment. I loved this cart. It was the perfect way to store all of those goodies for my students, and I never once had any student ask me where to find a supply. They picked up their handouts here as they walked into the room, and we were always ready to being as soon as the bell rang, without wasting any time handing things out. Even though I don't have this cart anymore (it belonged to the school), I still try to re-create this same idea by designating a similar space in my room. I think it not only frees me from having to hand out these supplies at every student request, but it also gives students ownership of the room. I told them it was their cart, and they had to maintain it. Believe it or not, I always had students who would offer to organize it during study halls or when they finished their work early. This past year, I will admit, my Supply Center wasn't nearly as complete. I had good intentions, but I learned the hard way how quickly said supplies would disappear from my classroom. The truth is, I was working with students who came from poverty and literally didn't come to school with a single pen or notebook. My supplies were just too much of a temptation and would often grow legs and walk away. This was especially true for pens/pencils. My students were in the habit of bringing them with them to the bathroom because they couldn't even trust their classmates to leave them on their desks. For these students, it was less important that they had access to these "bonus" supplies and more important that they had access to the basic learning materials. I provided each student with a file folder and composition notebook, which they were required to leave in my classroom. My school didn't have lockers, so this was the only way I could guarantee they would have anything to use in class. If I wanted them to keep it, it couldn't leave the room. So, even though it was annoying for me to have to waste time handing these things out and collecting them each day, I really did solve quite a few headaches by designating space in my room for students to keep their file folders, notebooks, and even their independent reading books. Having a supply center in my room has been a lifesaver for me as well. I have bookshelves that my students use to house their binders that stay in my classroom. On top of the shelves, I have a stapler, tape, hand sanitizer, lotion, tissue, handouts, my flower pens that students can borrow, etc. Like you said, it saves so much time. Like you, my pens would often grow legs and walk away, so I started making flower pens (It is highlighted in Made It Monday from this week). Although I do still end up having some "walk away," my students are pretty good about putting them back before they leave.